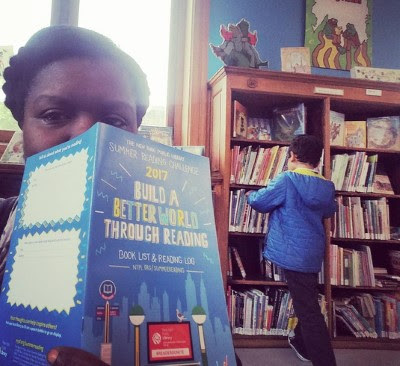 Just in time for when NYC public school ends for summer break, the NYPL has kicked off their Summer Reading program to help prevent summer slide and keep kids (and their parents) minds busy. Note: No compensation was received for this post. I chose to post about it because it's a great program to encourage and support kids (and families) reading. Any personal views expressed are always 100% my own. Of course I made sure we visited our local library to get our booklets. We've been part of the program for the last few years and enjoy discovering new books and authors. Along with sneaking in some of our favorite books not on the list. 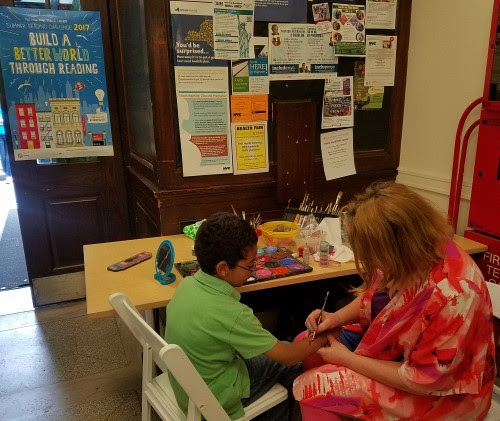 Once we had our booklet we were ready to attend the NYPL Summer Reading Kick off event at the Harlem Library. 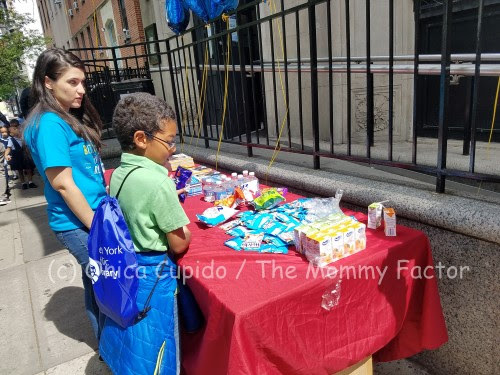 Once there we received a nypl summer reading bag (for our nypl books) and healthy snacks and drinks before heading inside for the days activities. The schedule for the day was filled with some many activities happening on all the 3 floors. It was going to be a busy day. We started by meeting author Tracey Baptiste who shared about her book and other that young readers would be interested in. Baptiste also hosted a "workshop" on how to survive against Jumbies. Then we headed downstairs to check out the different vendors there including The Studio Museum of Harlem. We joined other families in arts and crafts where we made a little hut. The hut craft was a tie in for the inHarlem sculptural works currently in community public parks. After crafting our hut, we decided to visit the real thing in the park right across from the library. My son was amazed by the "Hut" sculpture of Simone Leigh. We spent some time exploring and talking about it. Then we headed back inside to meet ELMO! 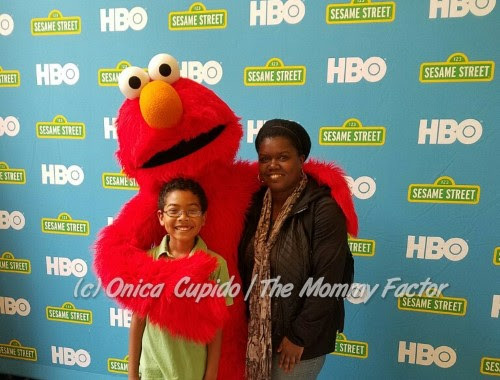 Since HBO was one of the sponsors supporting the event, they brought Elmo along. We're still big fans of the Sesame Street character so of course we got a photo with him. After we made a quick stop for face painting. Well really arm painting. After some back and forth on what to get we settled on a bird. With our arm painted, my son then visited another floor for some gaming. 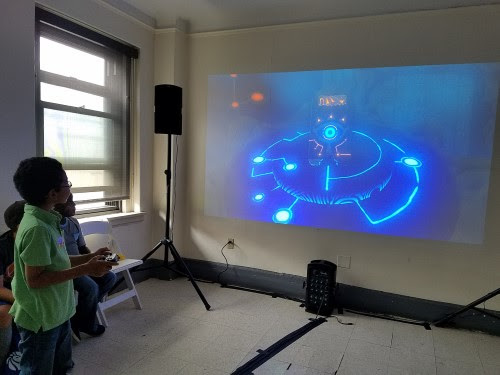 Did you know that you can play video games at the library?! Yup we've played a variety games on Wii, Xbox 360, PlayStation. Check your local library for more info. 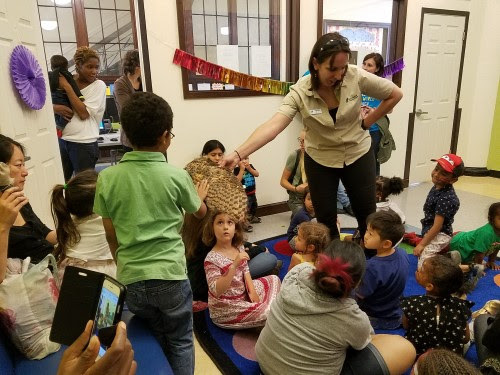 We left gaming to head to another floor to learn about animals with New Canaan Nature Center. We learned lots about birds of prey and my son even got to touch a wing. 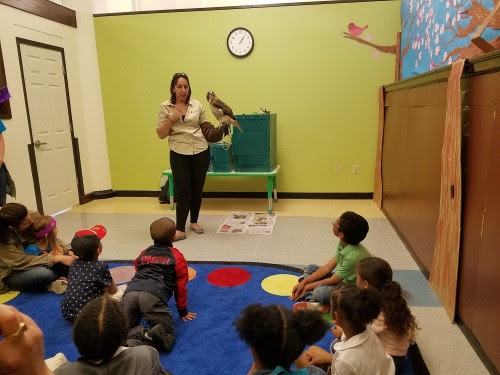 The kids were all excited to see the birds live and in person while learning about wild bird life and how to protect them. While there was still lots more activities to do, we had to head back home. But the fun didn't end there. For the rest of the month the various NYPL will host their own Summer Reading events. 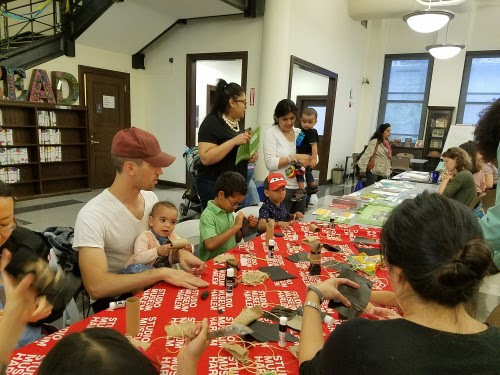 Throughout the summer, NYPL branches in the Bronx, Manhattan and Staten Island will offer a wide variety of events and workshops around the theme, encouraging readers of all ages to find ways to help their communities. Check the list of summer reading events at branches throughout the system. Mush is a huge reader, we also join our local library's summer reading program. She is currently reading "Dog Diaries: FALA" it's a series of books based on true stories of dogs in history. History is her passion, and she was so happy to see your picture, she's not the only kid who chooses to get her hand painted!